Back of the Cereal Box: Hooters Say: You’re Not Porking Enough! At best, it’s a request for more pig-meat. At worst, it’s something far less innocent. In either case, it’s the word of the week. morepork (pronounced… um… like it’s spelled) — noun: an owl of the genus Ninox inhabiting New Zealand and Australia. I offered the pronunciation the way I did not to crack wise — or “be cheeky,” as the moreporks might say — but to note that the pronunciation of the word changes quite a bit depending on whether you’re a North American English-speaker or not. In general, I think you’re meant to pronounce the word as you would the words more and pork. However, because Britons, Aussies, Kiwis and others pronounce the letter “R” differently than I do, the American pronunciation of the word loses quite a bit. 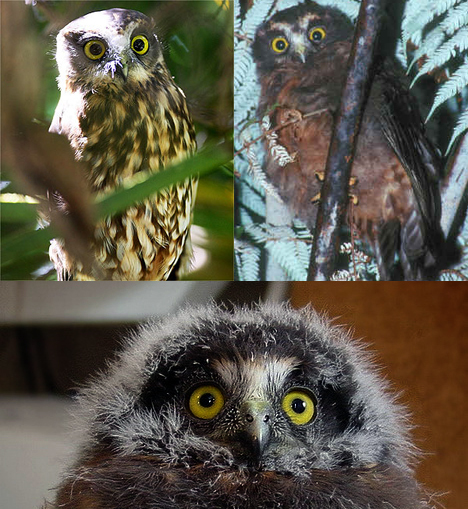 As you can see, the morepork has the unfortunate quality of always looking totally freaked out. Originally, morepork and other, less funny names for this owl such as mopoke and boobook began as onomatopoetic representations of its two-syllable hoot. (That is, the owls may not be what they seem, but they’re actively telling you what they are. The tendency to announce themselves may be characteristic of New Zealand birds, as the kiwi bird’s name is also onomatopoetic.) You can tell by the latter two names that you’re not meant to hear an “R” in morepork, but I’m actually not sure how an American should approach this one. With an affected British “R”? Or as he or she normally would, even though doing so would deprive the word of its reason for existing? This simple matter could easily be extrapolated into a whole book about interplay and imitation between Americans and Britons. We’ll call it The Morepork in the Mouth of the American. And it will surely mention the Winnie the Pooh character Eeyore, who, as I’ve noted earlier, suffers a similar fate. His name is also onomatopoetic — specifically of the noise a donkey makes. But you wouldn’t know it to hear an American pronounce Eeyore’s name. Coming from someone in A.A. Milne’s homeland, however, Eeyore sounds a lot like the American way of referring to a donkey braying, hee-haw. Plus “R,” minus “H.” Transcontinental English mathematics. But even being half-New Zealander, I don’t have a clue what morepork’s widow could mean. Ruth Park, I cannot fail to note, gained some fame later for the popular Muddle-Headed Wombat series of books. Oh, down under people — why must you be so down under? Finally, it’s worth mentioning that the owl saddled with this name is also known to some by yet other names, including ruru, spotted owl, marbled owl and tawny frogmouth. That last one is erroneous because the tawny frogmouth is a separate species. 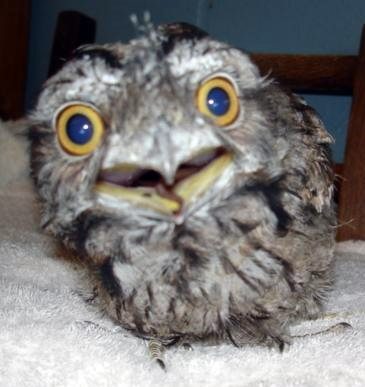 And that’s mention enough for me to post a rather endearing photo of a frogmouth doing what it does best: making a goofy face. For a bird that most cultures associate with wisdom, owls spend a lot of time looking all stupid.